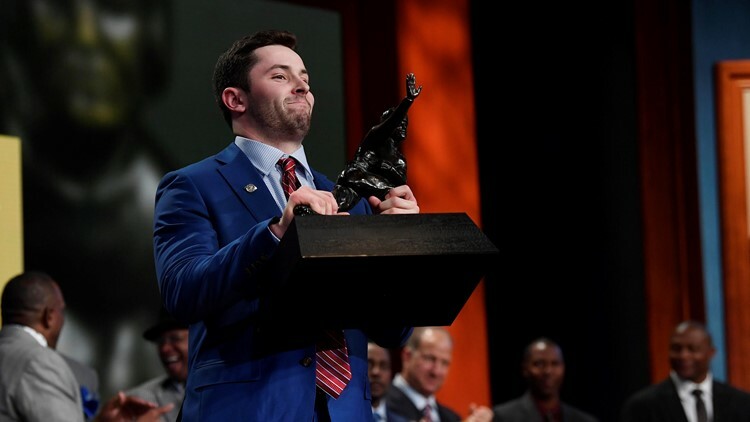 Oklahoma Sooners quarterback Baker Mayfield wins the 2017 Heisman Trophy during the Heisman Trophy presentation in New York City. Cleveland Browns rookie quarterback Baker Mayfield has moved into ESPN's Heisman House. CLEVELAND -- Cleveland Browns quarterback Baker Mayfield has moved into the ESPN Heisman House. In the latest in ESPN’s series of commercials, Mayfield is shown arriving on move-in day, and while former University of Florida Gators quarterback Tim Tebow brings only one duffel bag into the Heisman House, the Browns rookie brings an extended flatbed trailer full of gear. That is when the familiar beeping tones of Mayfield’s trailer began to sound. “Yo, where do I put my crap?” Mayfield asked the fellow residents, including Herschel Walker (Georgia), Tebow, Fremont, Ohio native Charles Woodson (Michigan), Derrick Henry (Alabama) and Barry Sanders (Oklahoma State). The 6-foot-1, 215-pound Mayfield completed 285 of his 404 throws (70.5 percent) for 4,627 yards and 43 touchdowns against just six interceptions to cap off his run to the Heisman Trophy in 2017. 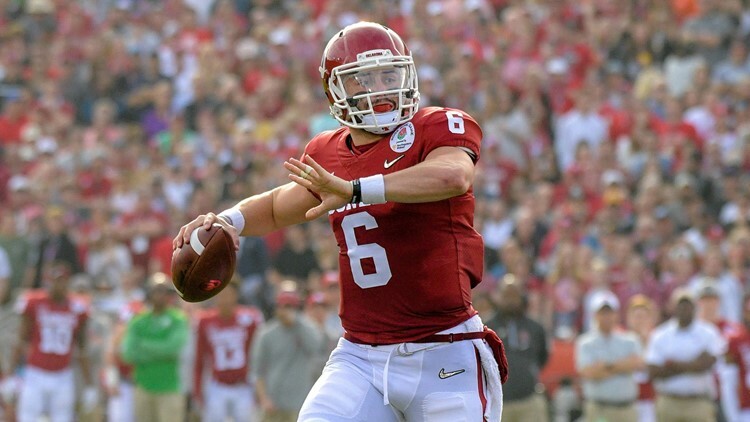 During his three years at Oklahoma and one season with the Texas Tech Red Raiders, Mayfield completed 1,026 of his 1,497 attempts (68.5 percent) for 14,607 yards and 131 touchdowns against only 30 interceptions. Oklahoma Sooners quarterback Baker Mayfield (6) throws a pass against the Georgia Bulldogs in the 2018 Rose Bowl College Football Playoff semifinal game at Rose Bowl Stadium in Pasadena, California. The No. 1 overall pick in the 2018 NFL Draft, Mayfield was given the chance to start the Browns’ final preseason game, and when he took command of the offense against the Detroit Lions at Ford Field in Detroit, the opportunity did not go to waste. Mayfield played the entire first half of the 35-17 victory and completed nine of his 16 throws for 138 yards, rushed for two yards and led three successful scoring drives, two of which finished in the end zone with running scores from Nick Chubb and Matthew Dayes, respectively. After the Browns received the opening kickoff, Mayfield engineered a nine-play, 80-yard drive that Chubb finished off with a three-yard touchdown run. Zane Gonzalez’s point-after gave Cleveland a 7-0 lead over the Lions with 10:09 to play in the first quarter. Mayfield completed three of his four throws for 55 yards on the drive, including a 41-yard pass to tight end Devon Cajuste on the very first scrimmage play of the game that moved the ball from Cleveland’s 20-yard line to Detroit’s 39. During his first preseason with the Browns, Mayfield completed 35 of his 61 attempts for 501 yards and two touchdowns against one interception. Currently, Mayfield is No. 2 on the Browns’ depth chart behind Tyrod Taylor.